CHICAGO – Can we end this 48fps nonsense now? Having seen “The Hobbit: An Unexpected Journey” in 3D/48fps, I found the film artificial and boring. At home, in traditional, flat HD, the movie works so much better. There are still some storytelling flaws but the theatrical presentation exaggerated the problems of the movie and I think it works so much better on Blu-ray than it did in theaters. Jackson’s eye for composition, his sense of epic scope — they don’t feel as bloated on the smaller screen. Once again, I stand by my theatrical review as that was the experience in theaters but the film is more likable away from the hype and on Blu-ray. It helps to have a nice selection of special features to offer insight into some of the decisions made by Jackson and his team. Compared to some of the releases for the “Lord of the Rings” trilogy, this one is kind of slight and it would be naive to think that it’s the final word on the film. An extended edition or even more special edition timed to “The Desolation of Smaug” seems inevitable. Until then, the only serious extra here is a massive collection of video blogs produced during the production of the film. So, you can see Jackson coming back to some of the same sets for the first time, the cast getting their blocking for the first scenes, and even the first meeting. It’s a nice window into the process for fans of “The Hobbit”. As for the movie itself, it looks truly great in HD (better than it did in theaters) and it’s nice to have DVD and Ultraviolet versions as well. I’m still putting “The Hobbit” in the disappointment column in terms of the film itself but this Blu-ray is a solid release for those who disagree. The first in a trilogy of films based on the enduring masterpiece “The Hobbit” by J.R.R. Tolkien, The Hobbit: An Unexpected Journey follows title character Bilbo Baggins, who - along with the Wizard Gandalf and 13 Dwarves, led by Thorin Oakenshield - is swept into an epic quest to reclaim the lost Dwarf Kingdom of Erebor from the fearsome Dragon Smaug. Their journey will take them into the Wild, through treacherous lands inhabited by Goblins, Orcs and deadly Wargs, as well as a mysterious and sinister figure known only as the Necromancer. Along the path, the unassuming Bilbo Baggins not only discovers depths of ingenuity and courage that surprise even himself, he also gain possession of a “precious” ring tied to the fate of all Middle-earth in ways he cannot begin to imagine. 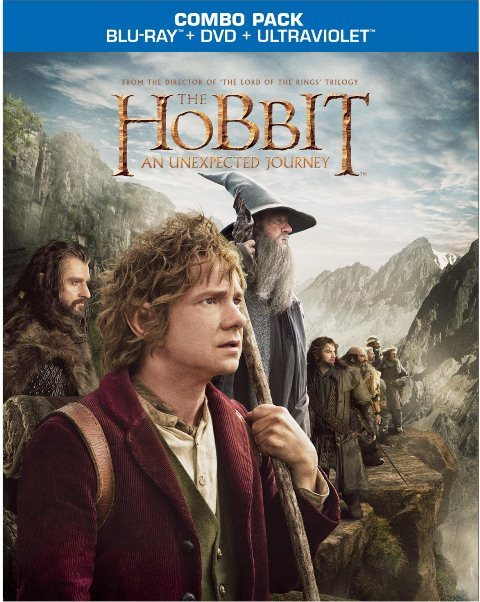 “The Hobbit: An Unexpected Journey” stars Martin Freeman, Ian McKellen, Hugo Weaving, Cate Blanchett, and Andy Serkis. It was directed by Peter Jackson and released on Blu-ray and DVD on March 19, 2013.